A relationship with the Burchell Memorial Baptist Church, that began in July 2012, has grown to include the Spot Valley and Tower Hill Baptist Churches. What started as funding to the Burchell Memorial Baptist Church youth programs, expanded to include the Thomas Burchell Scholarship Program – the initial scholarships were awarded in September 2012. In 2018, 14 scholarships were awarded to high school and college students from the three churches. We expanded the Thomas Burchell Scholarship Program to the Blessed Sacrament Cathedral in August 2015, using the partnership model and program requirements at the Burchell Memorial Baptist Church, to award one scholarship. We have since expanded and in 2018 awarded 22 scholarships through 9 parishes across the civil parishes of Hanover, Westmoreland, St. James, Trelawny and St. Ann. 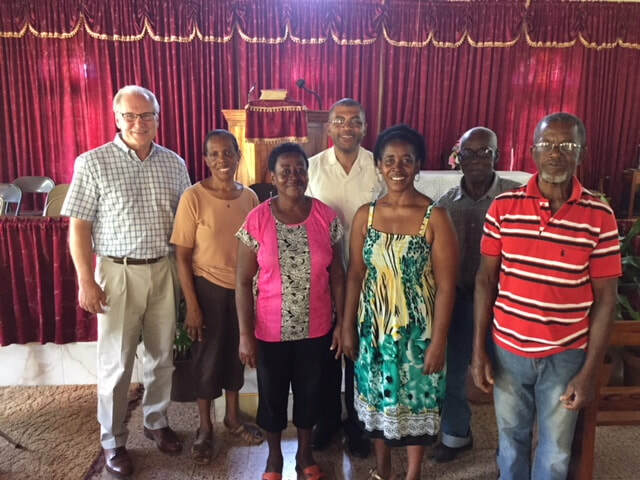 We're excited about the interdenominational partnership with the Burchell Circuit which enabled us to sponsor a joint service project to Mustard Seed Communities in August of 2018. The Orange Park Baptist Church joined our scholarship family in 2018 with one secondary student entering the program. We will also be working with the church's Basic School serving 3-6 year olds. We likewise welcome the Bethel Town Baptist Church and its three secondary scholars to the program in 2018.